The testimonials and references found here are offered to you by our many satisfied customers. As a general contractor, we understand the importance of building strong relationships with our clients through a combination of open, honest communication and the highest quality of craftsmanship possible. Thanks for our beautiful room!! We enjoyed it so much over the holidays- what a wonderful family gathering place it has already become! Thanks for all the sacrifice and hard work that created it for us. You have all become friends & we’ll miss seeing you around! Thanks for everything! Thanks for a neat & tidy job well done! I can’t say enough about Keith and his crew. It’s been a pleasure having people like them here, Keith helps make my job a lot better and I have all the confidence in the world the job here when it is complete will be a place for the people here in Marion County to be proud of for years to come. We want to commend your crew; they are not only really good at what they do, but also very friendly and easy to work with. Special thanks to Keith who made great effort to work with us to insure our satisfaction. In our humble opinion, Keith is a tremendous asset to your company. Thanks! Rory, You and your crew did a fantastic job on the clock tower. It looks so nice. Everyone was very professional and very friendly. The clock tower looks so much better and is definitely safe for another 100 years!!!! We as members of First Lutheran Church would like to express our sincere thank you to you and your most capable construction crew. Your expertise and knowledge in restoration has certainly given us a very quality renovation to OUR landmark church. We know that your company did a very thorough and painstaking job with the windows and roof work. The ability to work in harmony to achieve this proud project is very rewarding. If at any time you are in need of a recommendation for other restoration. Renovation and church projects, please feel free to contact us. Once again, thank you very much for your diligent and timely workmanship you have provided us. We certainly look forward to working again with your company in the future years. Thanks Rory, we continue to enjoy our “west wing” & deck. It serves us well for entertaining! Keep up the good work! Rory, Thanks for finishing the floor boards and thresholds- it looks great! Please pass on my thanks to the carpenter. 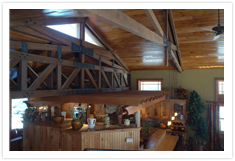 Are you searching for a general contractor in northern Illinois or southern Wisconsin? Contact Mulligan Restoration directly by calling 815-964-4210. Rockton, Roscoe, Rockford, Oak Park, Lake Geneva, Galena, and many others.